What makes a “great” business architect is a topic of much curiosity and debate. So this installment of StraightTalk is about you, business architect, and what makes you tick. P.S. Check out Post No. 6 for some background on what business architects do. Great business architects are probably more “made” through experience than they are “born,” but there are some characteristics that many have which might arguably be innate. For example, business architects are natural big picture thinkers where many others are not. For a great conversation, feel free to debate this one further with your friends. Okay, so what do I have to do to become a great business architect? Business architecture teams can and should aspire to be diverse, in terms of team member personalities, abilities, interests, levels of experience and focus areas. (BTW, more on how to build a business architecture team here in Post No. 7.) Part of where we run into trouble is trying to look for (or be) that uber business architect who is everything all in one: like that person who can architect an enterprise-wide business transformation, can work with executives to inform strategy and evolve the business model with brilliant ideas, can speak technology, has knowledge of the entire organization and industry, has worked with all disciplines across the strategy execution life cycle, is politically savvy, is influential, is a great storyteller and can create visualizations that will knock your socks off. While some of these creatures do exist in the wild, we are probably better served to envision and strive for the art of the possible, but embrace our strengths as individuals and be realistic about the journey to become the kind of business architect we want to be. What should we envision and strive for then? What is some of the most important knowledge for a business architect to have? Technology knowledge – Yes, great business architects should have knowledge of technology as well, both to help integrate the business and IT architectures, but also to help the business leverage technology strategically. This one has become even more important as the lines between business and technology have blended. Do business architects need to be subject matter experts? There are different schools of thought on this and ultimately you should do what makes the best sense for your organization’s needs and dynamics. Generally speaking though, a business architect does not need to be a subject matter expert, but they can absolutely be more effective if they have knowledge of the industry and business domain in which they are working. It is possible for too much subject matter expertise to work against you in this role, such as when you become biased, miss things or make assumptions. This topic is another fun one to debate with your friends. What is some of the most important experience for a business architect to have? Business architecture mapping – This can be a good place to start because you learn how the business architecture works and gain a great understanding of your organization from end-to-end. It can also help you build relationships and credibility with people across the organization. Using business architecture for portfolio management and initiative planning – This is probably one of the most valuable and relevant experiences to strive for. Architecting a business transformation – Once you’ve completely immersed yourself in a large-scale business architecture-driven business transformation and completed it from end-to-end, then you’re really in the game and can take your career in many directions. Having said all of this, make sure to chart your own course based on what interests you and where you want to take your career. For example, some business architects like to have another “emphasis” such as strategy, experience design, organizational design or technology. What are the key competencies for a business architect to have? What are the key characteristics of a great business architect? Top of the list: the ability to abstract, categorize and synthesize information – Structured thinking and a natural ability to see patterns is a critical ability for (and a sign of) a great business architect. Big picture thinking and systems thinking – Great business architects always think big picture. They think about the business outcomes, the enterprise and the ecosystem in which it operates, the overall “system.” They always connect the dots. On the other hand, a person who can’t keep their thinking out of the minutiae is not yet ready for the business architect role. Problem-solving ability and tenacity – Great business architects are thinkers. They are not only good at problem-solving but love doing so and are absolutely tenacious about it. Ability to communicate and connect – Since business architects function as architects, leaders and change agents – and since business architecture is often focused on introducing change to an organization – a great business architect is a great communicator. They can tell the story in words and pictures to inspire people at all levels to understand, agree to and move towards a new vision of the future. 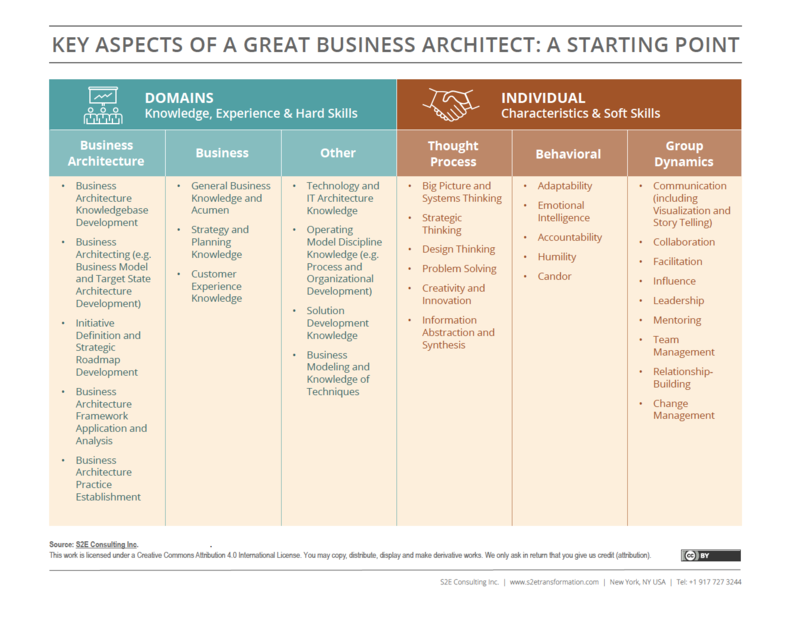 The diagram below reflects a bit of each of the four aspects to give you a solid starting point on what to look for (or aspire to) in a great business architect. How do I know if I have business architect potential? You model everything, including aspects of your personal life. You can’t help yourself from seeing patterns everywhere and categorizing things. You connect the dots between ideas and people. You can’t resist the urge to draw on a whiteboard. You are drawn into a big challenge, just because it sounds fun to you, and can’t stop yourself from working on it day and night. The Business Architecture Team (S2E white paper): If you’re new to StraightTalk and haven’t seen this one yet, this white paper covers a lot of details on the business architect role and team, including a starting point for a job description. The Evolution of the Business Architect (Clark and Kuehn white paper): A look at what the business architect role is and should be. 5 TED Talks to Get You Motivated and on Your Way to Greatness (TED Talk): A fantastic compilation of TED Talks for motivation and inspiration.